In support of its educational mission of promoting the role of all engineers in society, the School of Engineering and Applied Science presents the Grace Hopper Lecture Series. This series is intended to serve the dual purpose of recognizing successful women in engineering and of inspiring students to achieve at the highest level. Grace Hopper is a wonderful example of a visionary in her field who exhibited the type of pioneering spirit that is an inspiration to all of us. In support of the accomplishments of women in engineering, each department within the School invites a prominent speaker to campus for a two-day visit that incorporates a public lecture, various mini-talks and opportunities to interact with undergraduate and graduate students and faculty. This series provides another avenue for recognition of distinguished leaders in engineering and presents role models that help remind all of us why we chose this profession. 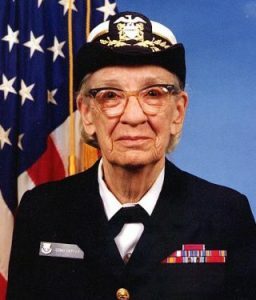 Rear Admiral Grace Hopper was a mathematician, computer scientist, systems designer and the inventor of the compiler. Her outstanding contributions to computer science benefited academia, industry and the military. In 1928 she graduated from Vassar College with a B.A. in mathematics and physics and joined the Vassar faculty. While an instructor, she continued her studies in mathematics at Yale University where she earned an MA in 1930 and a Ph.D. in 1934. Grace Hopper is known worldwide for her work with the first large-scale digital computer, the Navy’s Mark I. In 1949 she joined Philadelphia’s Eckert-Mauchly, founded by the builders of ENIAC, which was building UNIVAC I. Her work on compilers and on making machines understand ordinary language instructions lead ultimately to the development of the business language, COBOL. Grace Hopper served on the faculty of the Moore School for 15 years, and in 1974 received an honorary degree from the University.